Ethylene is an endogenous plant hormone that influences many aspects of plant growth and development. Some defense related genes that are induced by ethylene contain a cis-regulatory element known as the Ethylene-Responsive Element (ERE) [(PUBMED:2535512)]. Sequence analysis on various ERE regions has identified a short motif rich in G/C nucleotides, the GCC-box, essential for the response to ethylene. This short motif is recognised by a family of transcrition factors, the ERE binding factors (ERF) [(PUBMED:10715325)]. 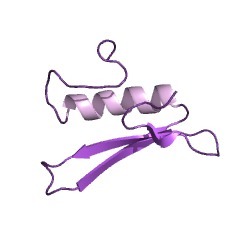 ERF proteins contain a domain of around 60 amino acids which is also found in the APETALA2 (AP2) protein [(PUBMED:7773013)]. 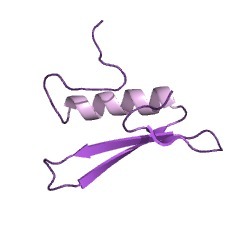 This AP2/ERF domain has been shown in various proteins to be necessary and sufficient to bind the GCC-box [(PUBMED:9756931)]. The structure of the AP2/ERF domain in complex with the target DNA has been solved [(PUBMED:9736626)]. The structure resembles that of bacteriophage integrases and the methyl-CpG-binding domain (MBD): a three-stranded beta-sheet and an alpha helix almost parallel to the beta-sheet. It contacts DNA via Arg and Trp residues located in the beta-sheet. Trichodesmium erythraeum, Tetrahymena thermophila, Enterobacteria phage RB49 and bacteriophage Felix 01 HNH endonucleases. HNH endonucleases are homing endonucleases that move extensively via lateral gene transfer [(PUBMED:15319480)]. There are 27042 AP2 domains in 23419 proteins in SMART's nrdb database. Taxonomic distribution of proteins containing AP2 domain. This tree includes only several representative species. The complete taxonomic breakdown of all proteins with AP2 domain is also avaliable. Click on the protein counts, or double click on taxonomic names to display all proteins containing AP2 domain in the selected taxonomic class. We demonstrated that the GCC box, which is an 11-bp sequence (TAAGAGCCGCC) conserved in the 5' upstream region of ethylene-inducible pathogenesis-related protein genes in Nicotiana spp and in some other plants, is the sequence that is essential for ethylene responsiveness when incorporated into a heterologous promoter. Competitive gel retardation assays showed DNA binding activities to be specific to the GCC box sequence in tobacco nuclear extracts. Four different cDNAs encoding DNA binding proteins specific for the GCC box sequence were isolated, and their products were designated ethylene-responsive element binding proteins (EREBPs). The deduced amino acid sequences of EREBPs exhibited no homology with those of known DNA binding proteins or transcription factors; neither did the deduced proteins contain a basic leucine zipper or zinc finger motif. 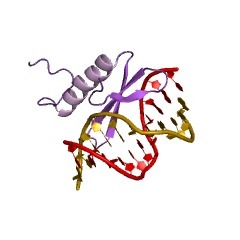 The DNA binding domain was identified within a region of 59 amino acid residues that was common to all four deduced EREBPs. Regions highly homologous to the DNA binding domain of EREBPs were found in proteins deduced from the cDNAs of various plants, suggesting that this domain is evolutionarily conserved in plants. RNA gel blot analysis revealed that accumulation of mRNAs for EREBPs was induced by ethylene, but individual EREBPs exhibited different patterns of expression. Control of Arabidopsis flower and seed development by the homeotic gene APETALA2. APETALA2 (AP2) plays a central role in the establishment of the floral meristem, the specification of floral organ identity, and the regulation of floral homeotic gene expression in Arabidopsis. We show here that in addition to its functions during flower development, AP2 activity is also required during seed development. We isolated the AP2 gene and found that it encodes a putative nuclear protein that is distinguished by an essential 68-amino acid repeated motif, the AP2 domain. Consistent with its genetic functions, we determined that AP2 is expressed at the RNA level in all four types of floral organs--sepals, petals, stamens, and carpels--and in developing ovules. Thus, AP2 gene transcription does not appear to be spatially restricted by the floral homeotic gene AGAMOUS as predicted by previous studies. We also found that AP2 is expressed at the RNA level in the inflorescence meristem and in nonfloral organs, including leaf and stem. Taken together, our results suggest that AP2 represents a new class of plant regulatory proteins that may play a general role in the control of Arabidopsis development.